FANCY SPENDING FOUR days per week taking photos of ridiculously cute puppies? And being paid for it? Well then you might want to send your CV to Dreamy Puppy, pronto. The upmarket pet shop in Chantilly, Virginia, is on the hunt for someone to take pictures and videos of its puppies, and has posted an ad for the position on Craigslist. Dreamy Puppy – which works with reputable local breeders to sell purebred and mixed breed pups – is offering the successful candidate $750 per week. That’s about €538 for four days work taking pictures and videos of puppies. And here’s who you’d be working with. Email “Need a new job? This pet shop wants a full-time puppy photographer”. Feedback on “Need a new job? 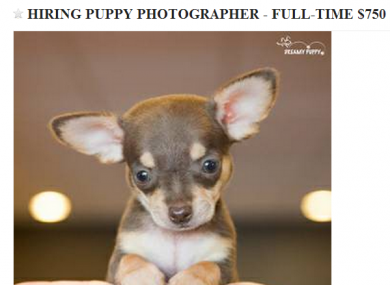 This pet shop wants a full-time puppy photographer”.